This guide has been developed to assist landholders with revegetation activities. Choosing your planting profile and species list. Local indigenous seed suppliers and nurseries. A guide for revegetation of landscapes within the Goulburn Broken Catchment. 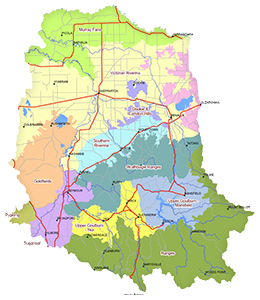 The catchment has been divided into 12 revegetation zones, based broadly on bioregions, geology and rainfall boundaries. When planning for a revegetation project there are many factors to consider from site preparation to selecting species. Understanding your planting profile is the first step. Identify your site's characteristics to determine which vegetation profile and species list best represents your site. In 2001 the Revegetation Guide for the Goulburn Broken Catchment was developed and published by the Department of Natural Resources and Environment. For over 15 years this guide has been a valuable reference for land managers planning revegetation projects to improve biodiversity across the Catchment. Funding through the Australian Government allowed an opportunity to upgrade the Revegetation Guide, and with much community consultation and engagement the guide has been built on to produce an online web tool with expanded planting lists. This upgraded Revegetation Guide still offers much of the same practical information as the old, such as how to manage and re-establish native vegetation, which local native trees and shrubs to plant in your area, and detailed information on indigenous plants across the Goulburn Broken Catchment. The main changes to this revegetation guide are in the development and expansion of planting lists for our wide diversity of vegetation types across the catchment. The original geographic zones have changed and now align with bioregion, geology and rainfall boundaries. The guide still offers general vegetation profiles but now with expanded lists for either revegetation projects to provide structure and cover, or enhancement planting lists to add to the diversity of a site. We hope you find the new additions useful and welcome any feedback regarding this online web tool.